Double-stud walls insulated with cellulose or low-density spray foam can have R-values of 40 or higher. They have been used in high performance housing since the 1970s; their advantages include trade familiarity with construction detailing (especially at the exterior), and the use of commonly available construction materials. However, double-stud walls have a higher risk of interior-sourced condensation moisture damage compared to high-R approaches using exterior insulating sheathing. Moisture conditions in double-stud walls were monitored from 2011 through 2014 at a new production house located in Devens, Massachusetts (U.S. Department of Energy zone 5A). The builder has been using double-stud walls insulated with 12 in. of open cell polyurethane spray foam (ocSPF); however, the company has been considering a change to netted and blown cellulose insulation for cost reasons. Cellulose is a common choice for double-stud walls because of its lower cost (in most markets). However, cellulose is an air-permeable insulation, unlike spray foams, raising interior moisture risks. Three double-stud assemblies were compared: 12-in. ocSPF, 12-in. cellulose, and 5-½-in. ocSPF at the exterior of a double-stud wall (to approximate conventional 2 × 6 wall construction and insulation levels, acting as a control wall). These assemblies were repeated on the north and south orientations, for a total of six assemblies. Data were collected from December 2011 through July 2014, capturing three winters of operation in various states. Winter 2011–2012 was very mild (warm) and the house had very low interior relative humidity (RH) because it was unoccupied. Winter 2012–2013 was colder and the house had very high (40%–50%) interior RH until the ventilation system was put into operation (mid-February 2013). Winter 2013–2014 was very cold, but the ventilation system was operated, resulting in moderate interior RHs. Under "normal" interior conditions (functioning ventilation system, wintertime RH 10%–30%), ocSPF walls (both 12 in. and 5-½ in.) with latex paint as interior vapor control (nominally Class III, but possibly more vapor open) showed low risk; all sheathing moisture contents (MCs) remained lower than 20%. However, the 12-in. cellulose wall had MCs higher than 20% on the north side. In addition, the cellulose wall sheathing-insulation interface had high RH conditions. Under high interior humidity loading (nonfunctional ventilation system, 40%–50% interior RH), all test walls showed MCs and sheathing-insulation interface RHs well into the high risk range. The cellulose walls showed particularly high MCs (sheathing in excess of 30%), while the ocSPF walls showed MCs in the 18%–25% range. In addition, the monitoring showed evidence of liquid water condensation (which can result in quick degradation) in all walls, the condensation was substantial in the cellulose walls. These condensation issues occurred on the north and south sides. But in all walls, during each summer after a winter of wetting, moisture levels fell well into the safe range. Based on the difference between the winters, it is clear that interior RH can have a tremendous effect on the performance of enclosure systems, in terms of interstitial condensation risks, when using more vapor-open interior finishes such as latex paint. The ocSPF walls showed consistently lower MCs and interface RH levels than the cellulose walls. Although air leakage cannot be eliminated as a possibility, it is likely that at the thicknesses applied, the ocSPF provided reasonable vapor control (1.5–3.5 perms when combined with Class III latex paint) under normal loading conditions. The collected data were analyzed in terms of ASHRAE Standard 160 criteria (tabulating hours with RH and temperatures that support mold growth), using the calculated surface RH at the sheathing-insulation interface. All north-facing walls failed through all three winters; in particular, there were large numbers of failure hours during the high humidity winter (2012– 2013). Sheathing-insulation interface temperatures and RHs during the high humidity winter showed many hours with mold risk conditions (high humidity and sufficient temperature for mold growth). When the walls were disassembled at the conclusion of the experiment, the sheathing and framing showed remarkably little evidence of wetting damage or mold growth. No visible mold growth or evidence of staining or water rundown was found. The damage was limited to some limited grain raise of the interior surface of the oriented strand board at the cellulose wall, and slight corrosion of fasteners and staples. Based on the data, calculations, and analysis, all three walls should be at high risk of failure; the analytic tools used indicate that these walls should have failed. However, disassembly showed that the walls were essentially undamaged by the monitored moisture exposure. This suggests that the walls, at least in the configurations tested, were far more robust than current analysis tools would indicate. Various theories were proposed on what protective mechanisms might be at work in these assemblies, in particular, the effect of cavity fill insulation. The cellulose walls were likely protected by borate preservatives (which inhibit mold) and the ability to safely store moisture. However, the literature shows that although borate-treated cellulose can have significant mold-inhibiting effects, it is not a panacea; if the moisture loading is sufficiently high, mold will grow. The protective mechanism of the ocSPF wall was not clear; proposed theories included restriction of oxygen to the sheathing-insulation interface, flash heating of the surface during spray foam application (thus sterilizing the interface), coating of the substrate surface with a polyurethane film (thus rendering the wood inaccessible to mold), and capillary redistribution of moisture. Based on resources in the literature, the oxygen theory seems unlikely, given the low oxygen requirements of mold. Similarly, the flash heating theory seems unlikely: the time required to sterilize samples is longer than would occur during installation. Surface treatment and capillary redistribution seem to be plausible, albeit unconfirmed, explanations. In terms of construction recommendations, a Class II vapor retarder (e.g., variable permeability membrane or vapor retarder paint) will reduce moisture risks in the cellulose walls to more reasonable levels. But it is entirely likely that many double-stud walls are insulated with cellulose with only Class III vapor control and provide fine service. It is a marginal judgment call whether a Class II vapor retarder is needed or warranted in ocSPF walls. In either case, a Class I vapor retarder (polyethylene) is not recommended, because it completely eliminates inward drying. Double-stud walls insulated with cellulose or low-density spray foam can have R-values of 40 or higher. They have been used in high performance housing since the 1970s; their advantages include trade familiarity with construction detailing (especially at the exterior) and the use of commonly available construction materials. However, double-stud walls have a higher risk of interior-sourced condensation moisture damage compared to high-R approaches using exterior insulating sheathing. Insulation outboard of structural sheathing increases (warms) the winter temperature of the sheathing, while additional insulation inboard of the sheathing decreases its temperature (Straube and Smegal 2009). 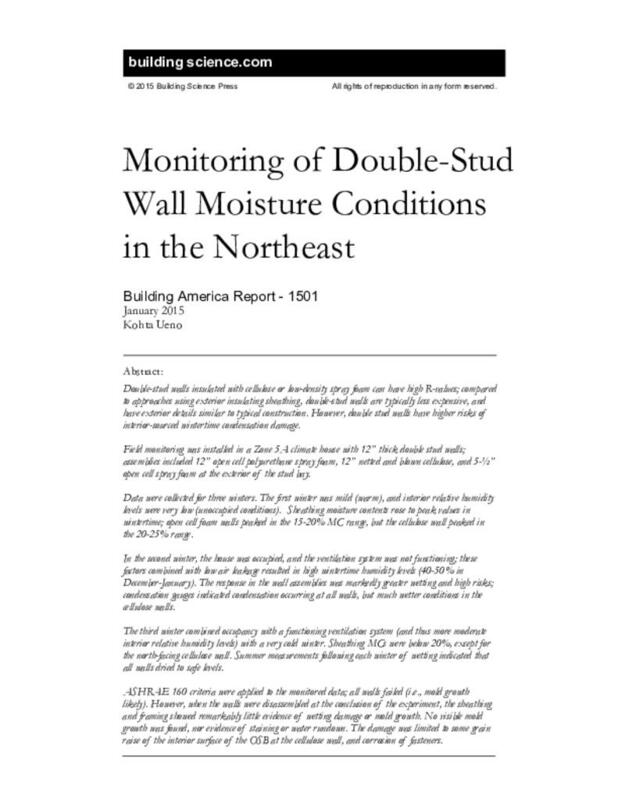 Moisture conditions in double-stud walls were monitored from 2011 through 2014 at a new production house located in Devens, Massachusetts (U.S. Department of Energy [DOE] zone 5A, per ICC 2009). The builder, Transformations, Inc., has been using double-stud walls insulated with 12 in. of open-cell polyurethane spray foam (ocSPF); however, the company has been considering a change to netted and blown cellulose insulation for cost reasons. Cellulose is a common choice for double-stud walls because of its lower cost (in most markets). However, cellulose is an air-permeable insulation, unlike spray foams, raising interior moisture risks. Three double-stud assemblies were compared: 12 in. of ocSPF, 12 in. of cellulose, and 5-½ in. of ocSPF at the exterior of a double-stud wall (to approximate conventional 2 × 6 wall construction and insulation levels, acting as a control wall). These assemblies were repeated on the north and south orientations, for a total of six assemblies. Sensors within the wall measured wood moisture contents (MCs) (of sheathing and framing), temperature (T), and relative humidity (RH). Interior and exterior boundary conditions (T/RH) were also monitored. Transformations, Inc. is a residential development and building company with a proven track record of delivering high performance superinsulated housing at a cost-effective price point in a variety of Massachusetts markets (DOE zone 5A). These houses have been covered in previous work, including Bergey and Ueno (2011), Ireton (2013), and Ueno et al. (2013). For reference, the basic enclosure and mechanical specifications for their work are shown in Table 1. A typical Transformations enclosure cross section is illustrated in Figure 1. Part of Transformations Inc.’s strategy of producing high performance homes without a significant cost increase is to offset the cost of upgrading the building enclosure/shell by reducing the size and cost of the mechanical systems. Double-stud walls with ocSPF have been standard components of Transformation’s production-level high performance houses (Figure 2). Given the Building America goals of reducing home energy use by 30%–50% (compared to 2009 energy codes for new homes and pre-retrofit energy use for existing homes), double-stud walls are a commonly considered option for high R-value walls. Greater understanding of the moisture risks associated with these walls (and exploring potential solutions) opens up options for builders of high performance houses. The common concern for double-stud walls is the potential durability risks associated with this wall assembly. Reduction of heat flow through an assembly results in reduced drying; therefore, higher R assemblies are more vulnerable to moisture-related damage (Lstiburek 2008). Energy conservation and durability are both cornerstones of sustainable design; emphasizing one attribute while sacrificing the other is a poor tradeoff; the two must be balanced against each other. Double-stud walls insulated with cellulose or low-density spray foam can have R-values of 40 or higher. They have been used in high performance housing since the 1970s; their advantages include trade familiarity with construction detailing (especially at the exterior), elimination of thermal bridging in the field of the wall (albeit not at window openings or floor framing), and the use of commonly available construction materials (Coldham 2010; Wagner 2012). However, double-stud walls have a higher risk of interior-sourced condensation moisture damage compared to approaches using exterior insulating sheathing. Insulation outboard of structural sheathing increases (warms) the winter temperature of the sheathing, while additional insulation inboard of the sheathing decreases its temperature (Straube and Smegal 2009). This is demonstrated in the thermal simulation results shown in Figure 3 and Figure 4, which compare temperatures for a double-stud wall with a 4-in. exterior foam wall, assuming an interior temperature of 68°F and an exterior temperature of –4°F. The surface that is the most likely to experience condensation (interior side of exterior sheathing) is highlighted in each wall in gray, showing the relative risks of air leakage or vapor diffusion-based condensation. If a double-stud wall is compared to a 2 × 6 wall with the same type of stud bay insulation and no exterior insulating sheathing, the double-stud wall sheathing experiences colder wintertime temperatures and less heat flow. Both of these factors increase the risks of moisture-related problems (Lstiburek 2008; LePage et al. 2013). Low-density spray foam (ocSPF, 0.5 lb/ft3 or 8 kg/m3), with a similar R-value to cellulose, is believed to have lower moisture risk because its superior control of air leakage reduces the risk of wetting the exterior sheathing by interior-sourced moisture. However, the insulation material is still open to vapor diffusion: a 12-in. (305-mm) thickness of ocSPF has a vapor permeability of 7.3 perms/419 ng/(Pa·s·m2) (both wet and dry cup; ASHRAE 2009a), while 12 in. of cellulose is roughly 7–10 perms/402–575 ng/(Pa·s·m2) (dry and wet cup). Arena et al. (2013) monitored MCs in double-stud walls insulated with cellulose in DOE zone 5A (Devens, Massachusetts). Walls were monitored for temperature, RH, and MC on the north and south sides. The wall thickness was 10-½ in. (267 mm), resulting in nominal R-40 (RSI 7.0) insulation. A vapor retarder primer (Class II) was applied to the interior gypsum board. South side sheathing MCs peaked near 17%, while north side MCs peaked at slightly higher than 20%. Wintertime interior RH levels were typically in the 20%–30% range, with slightly higher than typical interior temperatures 72°–73F (22°–23°C). The assemblies were also simulated using WUFI; correlation between measurements and simulations were difficult; the model was tuned assuming a bulk water leak at the MC pins, which improved correlation. The assemblies were also evaluated in terms of ASHRAE Standard 160 criteria: based on monitored data, both north and south walls fail. However, the authors have simulated other common walls using ASHRAE 160, and have found that many commonly used walls fail this test, which suggests that the standard has overly conservative criteria for failure. Arena (2014) continued work on monitoring double-stud walls, using New York State Energy Research and Development Authority (NYSERDA) funding to monitor two walls in climate zone 6 (upstate New York). The study compared two double-stud wall designs: a 12-in. cellulose wall, and one with 3-½-in. ccSPF at the exterior of the stud cavity, with the remainder filled with 8-½-in. cellulose insulation. Sheathing MCs through winter 2013–2014 remained in the safe range (daily averages below 12%). This monitoring is ongoing, and will be reported on in late 2014. The researchers found similar problems with ASHRAE 160: most of the walls fail the criteria (both measured data and WUFI simulations), even though monitoring shows low risk based on sheathing MCs. Fox (2014) monitored multiple high R-value wall assemblies in a test hut in Kitchener-Waterloo, Ontario (climate zone 6A); the test was run from October through June, capturing one fall- winter-spring period. The walls included deep cavity walls insulated with dense-packed cellulose (double stud and I-joist), cavity walls with exterior insulation (polyisocyanurate, XPS, and mineral wool), a ccSPF wall (with 2 × 8 studs), and a “datum” or baseline comparison wall (2 × 6 with cavity insulation). . .